Summary Review If there is a game more in need of an experienced player or a tutorial video to understand what the heck is happening than Kodama, I wouldn't know it. Kodama offers a charming premise: you're building a tree to endure multiple seasons that can't touch other trees, can't run branches back on itself, and if you can create matching combos of branch/fruit types on your tree, you'll score more points. 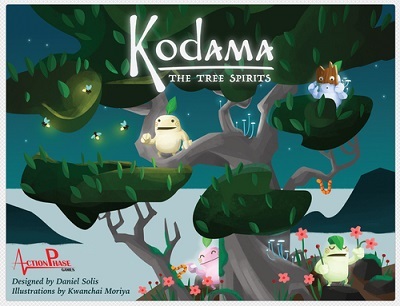 Detailed Review Kodama is so cute, I wanted very very badly to like it. Kodama seems to offer a simple, but unique gaming experience that offers a nice break from massive, complex games like Sythe or Waterdeep. However, the should-be-fun-for-all-ages game shoots itself in the foot with an overbearing and overly-complicated scoring system, a terrible points management board, and a rulebook that is not written with player understanding in mind. If there is a game more in need of an experienced player or a tutorial video to understand what the heck is happening than Kodama, I wouldn't know it. Kodama offers a charming premise: you're building a tree to endure multiple seasons that can't touch other trees, can't run branches back on itself, and if you can create matching combos of branch/fruit types on your tree, you'll score more points. The components are beautiful (expect for the impossibly small score tile), the art of the trees is bold and detailed, and the cartoony feel doesn't look too childish, although would easily appeal to children. However, getting to use these things to play is next to impossible because of how poorly the rules establish the game play.